Don’t miss Artist C. Finley’s wallpapered dumpsters located outside of the Phoenix Hotel. The Wallpapered Dumpster Project is an inquiry into urban waste, free art, and notions of femininity, beauty and domesticity. This ongoing series of urban interventions will continue in select cities in America and Europe through 2011. 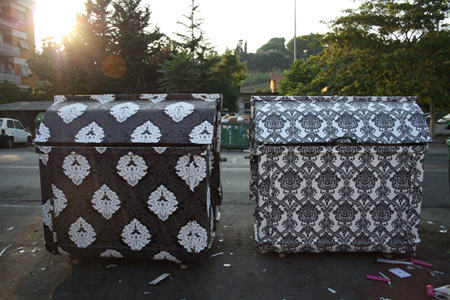 Previous dumpsters have appeared in Rome and around Los Angeles and have remained wallpapered for up to a year, depending on use and environmental factors. Finley will also be exhibiting an interdisciplinary installation at ArtPadSF including paintings, drawings, sculpture, collage and video. This entry was posted on Monday, May 16th, 2011 at 5:59 pm	and posted in Inside Art, Is it Art? !, Thoughts From RJT. You can follow any responses to this entry through the RSS 2.0 feed.